An additional source of biologically active substances of plant origin. It promotes normalization of blood pressure, improvement of cardiovascular system functioning. 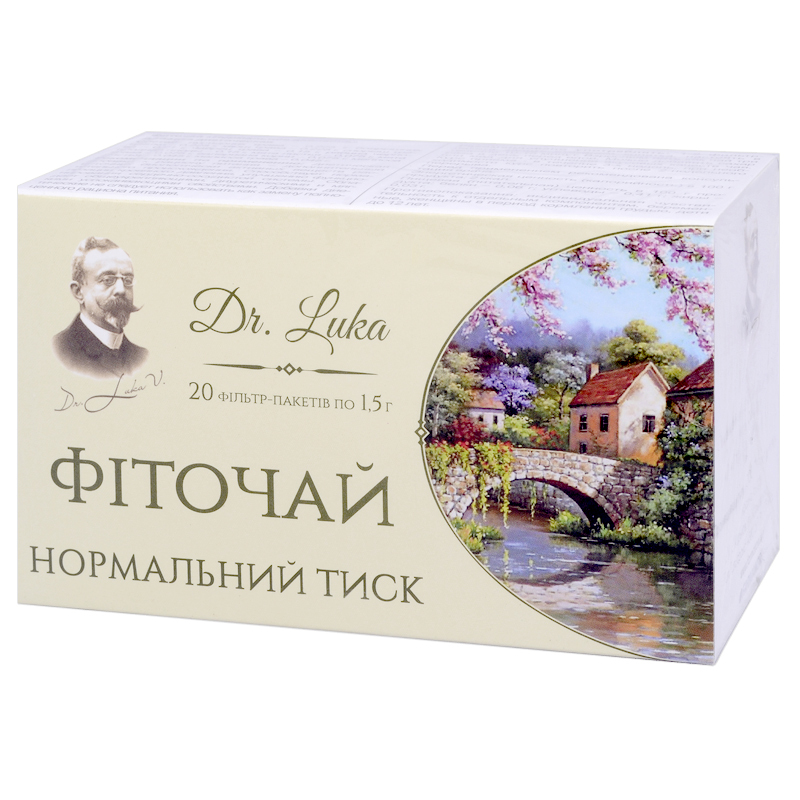 It has general health-improving, diuretic and soft calming effects. Motherwort plant — 0.225 g, hawthorn flowers – 0.225 g, horsetail plant — 0.225 g, knotgrass (polygonum) plant — 0.15 g, chokeberry fruit — 0.15 g, mint leaf — 0.075 g, mint grass — 0.075 g, Melissa leaf — 0.045 g, Melissa plant — 0.045 g.
Motherwort has expressed sedative, spasmolytic and hypotensive effects, slows down heart rhythm and intensifies heart force. Motherwort helps stabilizing heart rhythm and strengthens myocardium, has spasmolytic and anticonvulsive effects, reduces blood pressure, cholesterol, glucose blood levels, pyruvic acid and lactic acid levels, stabilizes protein metabolism and eliminates excess fats. Hawthorn intensifies blood flow in the coronary and the cerebral vessels, increases myocardium sensitivity to cardiac glycosides, it has calming effect, normalizes blood pressure. Knotgrass (polygonum) prevents formation of uroliths and helps eliminating them in case of nephrolithiasis, increases diuresis, eliminates sodium and chlorine ions excess with urine, improves filtration in the renal glomeruli and reduces reabsorption in the renal tubules, reduces blood vessels walls permeability. It reduces blood pressure, has anti-inflammatory and antitoxic effects. Horsetail is used as a diuretic, hemostatic, anti-inflammatory, antimicrobial and hypotensive agent. Chokeberry (aronia) reduces blood pressure due to gradual dilation and improvement of permeability of capillaries and other blood vessels, it is recommended for hemorrhagic diathesis, bleedings of various ethology (in case of excessive blood clotting), for burns treatment, for hypoacid gastritis. Mint regulates arterial and venous circulation, prevents increase of intracranial pressure and redirects blood outflow to external veins. Mint slows down fermentation and decay processes, improves function of the digestive glands and the pancreas, stimulates peristalsis. It has antiseptic, diuretic, sedative, laxative effects. Melissa reduces blood pressure, reduces respiratory and heart rates. Its diaphoretic and calming effects are also well-known. It has spasmolytic, analgesic, hypotensive, calming, diuretic, antiflatulent, bactericidal effects, it improves digestion, reduces respiratory rate, promotes reduction of heart rate, reduces strain of unstriated muscles of the intestine, stimulates digestive enzymes production.